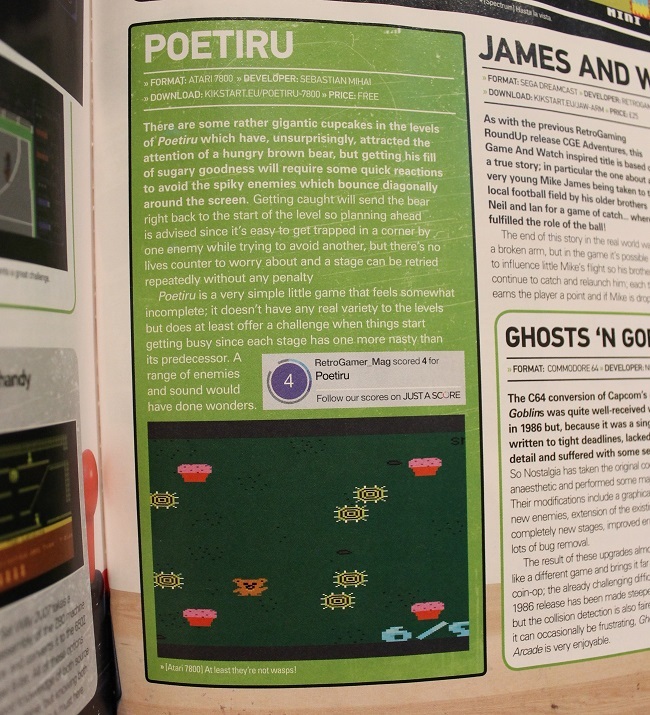 In Poetiru, an Atari 7800 homebrew game, the player controls a brown bear who must eat four bouncing cupcakes. There are nine levels to clear, each level featuring an additional enemy. At the beginning of each level the bear is invulnerable and cannot move until the player presses the fire button to begin. Use this to your advantage, to wait for a gap in the enemies' movement. "Poetiru" is a word I invented while sleeping, in a dream. I was dreaming that I was talking to another person, and explaining that, in some foreign language, "poetiru" means "story". This foreign language was something I made up, of course. However, I think "poetiru" was adapted from real word "povestire", which is Romanian for "story", or "short story".